The geographical terrain of Shanghai has influenced the types of ingredients and cooking methods used in Shanghai cooking. Numerous cuisines from different groups from around the world and from within China have also contributed to Shanghainese food practices. 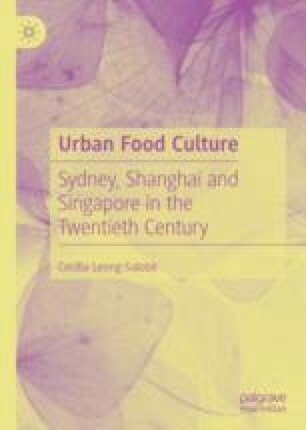 The chapter looks at how housing, in particular, the shikumen houses, gave rise to street food culture. It also investigates how European restaurants and food supplies catering to Westerners contribute to the cosmopolitan foodways. Shanghai has also benefitted from and influenced by cookery from imperial kitchens. As well, high-level government officials and wealthy merchants from other regions and countries who flocked to Shanghai and its surrounding cities and towns contributed to culinary excellence. By the early twentieth century, Shanghai has developed the most diverse cuisine in China. http://www.china.org.cn/travel/2012-07/18/content_25944840_2.htm. Accessed 16 Aug 2017.